The Texas State University Student Recreation Center addition and renovation was overwhelmingly approved by a 2005 student referendum giving the students access to over 100,000 sq. ft. of recreational leisure activities. Designed by Marmon Mok Architects of San Antonio, the two-level expansion includes a natatorium, rock climbing wall, computer labs, multi-purpose exercise and weight rooms, golf simulator, four playing courts, snack bar and lounge, offices, and auxiliary space. 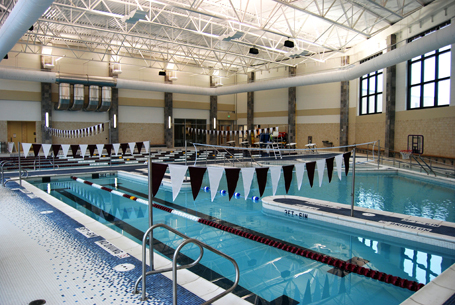 The center’s natatorium, designed by Counsilman-Hunsaker, features a 3,200 sq. ft. lap pool and a 2,200 sq. ft. leisure pool, both built as above-grade structures over an existing limestone bed. This was designed to avoid significant rock excavation and took advantage of the 12 ft. slope at the south end of the site. This limestone formed an easy foundation for inexpensive storage and mechanical space under the pool deck. Because fitness swimming remains one of the most popular forms of exercise among students and faculty, the lap pool features six lanes that are 25 yards in length, with depths ranging from four feet to nine feet. Water basketball and water volleyball, as well as a bubble couch are also available for leisure activity. The zero-depth entry leisure pool provides easy ingress/egress and two additional lap lanes that are 15 yards in length.